Avian Plus™ | Zoo Med Laboratories, Inc. 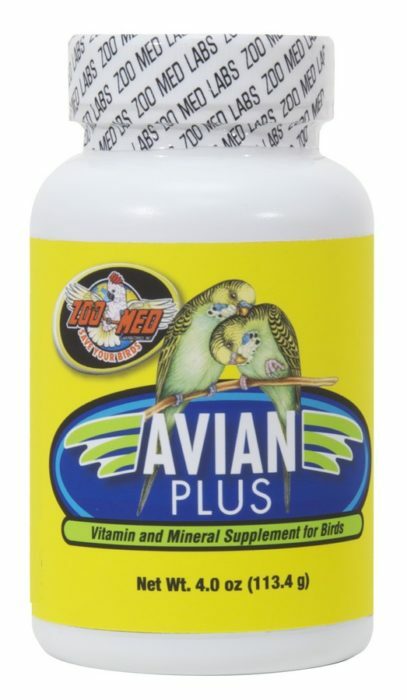 Zoo Med’s Avian Plus™ vitamin and mineral supplement for birds is milled to a very fine powder for maximum adhesion to seeds. It has a calcium base to ensure healthy bone development in juveniles, strong shells, and proper calcium metabolism in breeding females. The first bird vitamin to include the complete amino acid complex for enhanced plumage and proper protein digestion. Features orange flavoring for bird appeal with no preservatives. The only bird vitamin to use 16 isolated amino acids for improved bird digestion and color. As a dietary supplement for birds, sprinkle powder directly on seed 3 feedings per week.